A few years ago, I saw August Wilson's Gem of the Ocean three or four times. I even took my Mom to see it - we were there the day that Tipper and Al Gore were there and boy, was my Mom excited! Anyway, I had never felt like that in the theatre. The only thing that even comes close is Caroline or Change, August: Osage County or Sweeney Todd where I am just about overwhelmed and consumed. 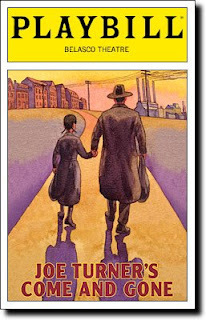 This production of Joe Turner's Come and Gone is a revival and is staged by Lincoln Center Theatre. Bart Sher is directing and it's obvious that his soft touch, but it's not overdone. I love August Wilson's plays. They are so everything - funny, poignant, frightening, heartbreaking, triumphant. The dialogue is so rich and intricate. I love anything that is serialized and these plays are, but not obviously so. They are part of a cycle of plays that August wrote. Each play takes place in a different decade of the twentieth century and is basically about the African American experience, although some of the the characters are not African American. In this play, there is one white character - Selig - who also makes an appearance in Gem. The richest character in Joe Turner's, Bynum seems a composite of Aunt Esther and Solly Two Kings from Gem and he is absolutely wonderful. Roger Robinson plays him beautifully. The rest of the cast, most of whom are making their Broadway debuts, are solid and well cast, particularly Ernie Hudson and LaTanya Richardson Jackson, as the husband and wife owners of the boarding house in which the story takes place. I wept in the second act of this one. I really, seriously did. Read the wikipedia entry if you want to know what it's about. If you have a chance to see an August Wilson play, don't miss it. This production runs at the Belasco until June 14th.